Leon: Fast, healthy, and cheap for London. They have lots of variety and everything is delicious. Special shout-out to the completely gluten-free baked goods section (and the cranberry bakewell). This was my go-to place. It’s a chain, so you can find it from Regent Street to the South Bank. Planet Organic: Heaven in a sweet little store. Also a chain, but I frequented the Torrington Place location. In addition to a well-stocked grocery, they also have a smoothie and hot foods bar, baked goods, tons of prepped lunches to go, AND a fantastic hot drinks selection a la Cafe Gratitude in LA so you know it’s good. It’s kinda pricey but my guess is that if you’ve been living with dietary restrictions for a while, you’re used to it. And this stuff is great so it’s worth it. Vantra: VEGAN HEAVEN. Also everything is gluten, sugar, GMO, etc. -free. Menu + treats + hot and cold drinks + hot foods self-serve buffet. You sit on tree trunks which is cool but they’re also very heavy (don’t say I didn’t warn you). A great oasis on the always crazy Oxford Street. The Attendant: Have I mentioned this place before? Probably several times and several more to come. 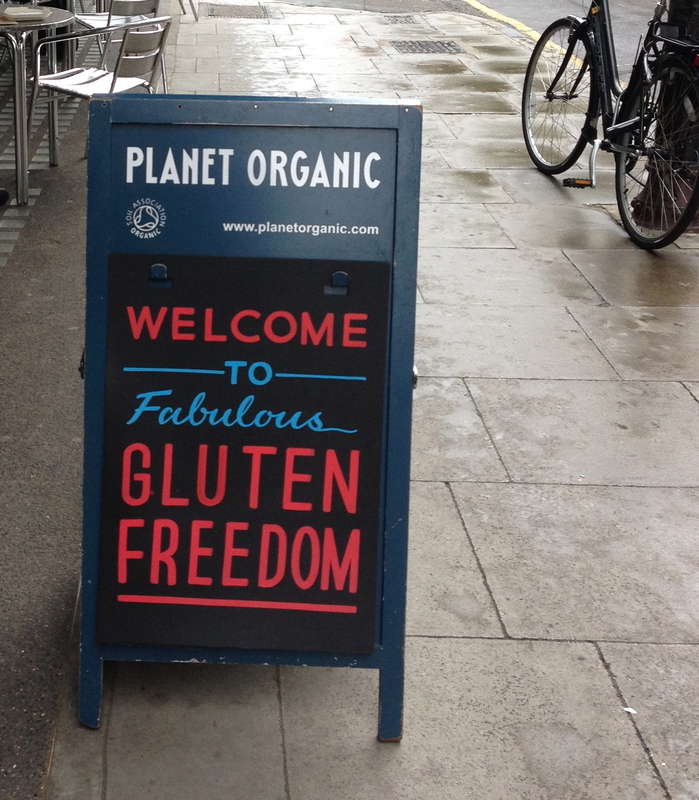 My favorite spot in London and they always have at least one gluten-free baked good PLUS they have almond milk. In the winter, their almond milk porridge is a must. This place is also located underground in a Victorian era toilet and has the friendliest staff, but that’s beside the point. Go here. Beatroot: Another small chain with great healthy options. They’ve got a salad bar, juices, and prepped snacks if you’re on-the-go. Great option for a quick fix. Waitrose: Known as a slightly upscale grocery store, though the prices aren’t awful. Their gluten-free section (known in the UK as “Free-From”) is pretty outstanding, with options ranging from proper scones to crumpets to jaffa cakes. Very British and also gluten-free? You’ve gotta go. Free-From Bakehouse: Oh so many delicious baked good options. So tempting and SO worth it. Look out for them in the area closer to Southwark Cathedral with tents (not the permanent part). The Veggie Table: Yummy veggie & vegan burgers w/ the option of having it served with lettuce in place of a bun. Filling and delicious. Find them by the Southwark Cathedral in the line of hot foods vendors. Mini Magoo: They make an insane gluten-free granola. Pricey, but such a great treat. Find it near the Free-From Bakehouse. Mildred’s: Never made it there, but I’ve heard nothing but amazing things about this place. Lots of places now offer tea suited for folks with dietary restrictions, but be wary of requesting both gluten-free and dairy-free/vegan. I tried this once and had fruit and sorbet — not really an English tea. The next time I just asked for gluten-free and had a wonderful assortment of pastries at the Montague, even though they weren’t vegan. Kind of a tricky one. (But if you’re cool not going out for tea, get goodies from Waitrose, Planet Organic or the Free-From Bakehouse and stage your own!) If you do go out for tea, be sure to phone in your request a couple of days earlier to be sure they are prepared to accommodate you. Cider is widely available at bars. Some, like Princess Louise, even offer specifically gluten-free/organic versions on the menu. Check out street food! Most stalls serve ethnic fare and often doesn’t include bread or meat. Popular street-food destinations include Spitalfields Market, Brick Lane Market (my favorite! ), and Camden Market. Many other grocery stores have small “Free-From” sections, including Marks & Spencer (great salads!) and Sainsbury’s. Waitrose’s just happens to be the largest (though only at their larger locations).